Home improvement, DIY, woodworking, landscaping, garden building, they're all difficult topics. We're here, however, to tell you that you can do these things yourself with the right planning and a bit of help. So often we’re left wondering what decorative to add to that stunning staircase of ours, just to spruce it up a tad. A side table? A vase with fresh-cut flowers? How about a nicely patterned rug or a dazzling chandelier hanging above it? 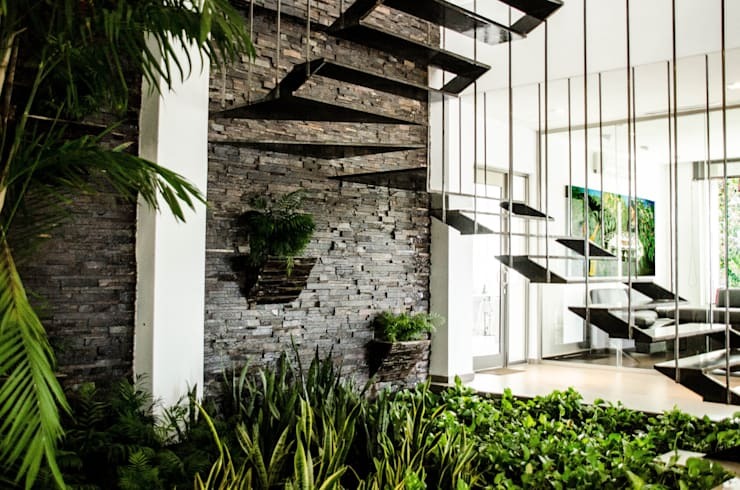 Although all of these ideas are enough to wow that stairway, there is another option that we (and quite a few homeowners and interior designers) are also very fond of: an interior garden. 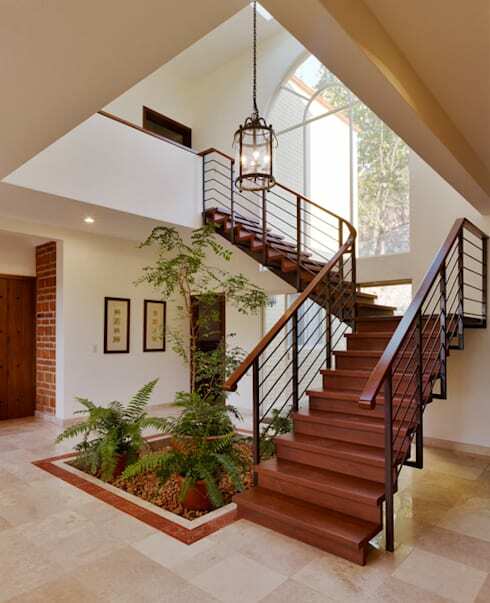 We are not talking about planting a multitude of fruit trees or a spacious vegetable patch, but a light touch of greenery underneath (or next to) that staircase can be quite a charming and elegant touch. 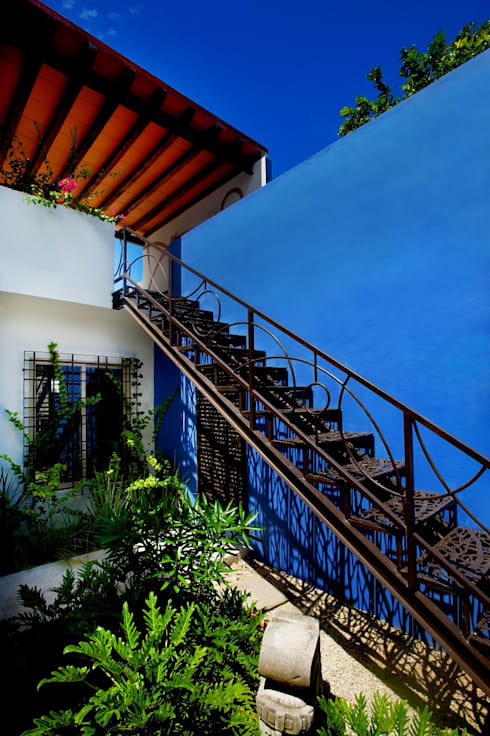 So, to convince you (and treat ourselves to some visual beauty), find herewith 10 examples of how the combination of a garden and staircase can work exquisitely well. Colour is a language that everybody speaks, but sometimes we just need a little bit of translation to help us along. See how stunningly this garden and staircase come together via those terracotta tones: earthy browns and beiges beautifully linking the two areas up, making for quite the focal point in this scene. We just love this exterior setting, with a wrought-iron design conjuring up a very striking external staircase in a dark rustic tone, contrasted (or would that be ‘complemented’?) most superbly by the fresh, lush greens right next to it. We are not sure if that ocean-blue wall was painted before or after the addition of the garden, but we are very certain that the greens and blues make for quite the eye-catching effect of tranquil coolness. Let’s be honest: the staircase is not one of those areas where we spend a lot of time. We’re either up or down those steps, and then it’s on to someplace else – and that means that weird little nook underneath the stairs often goes to waste. 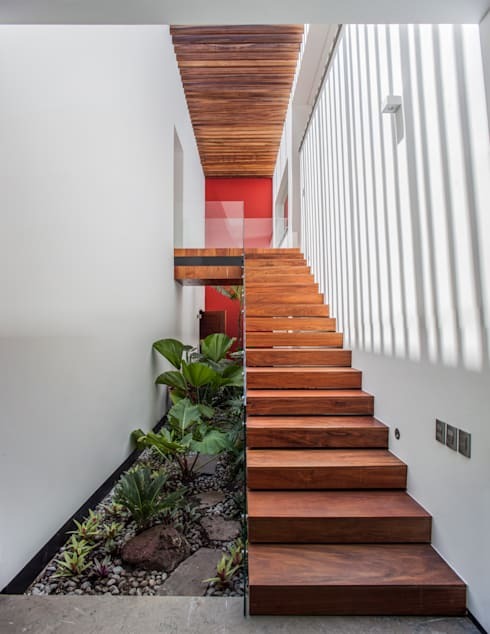 Not this time – Arkot Architecture + Construction really make a striking change to this stairway by adding in an abundance of lusciousness that will definitely make anybody stop and stare. The same way that your exterior garden requires planning and maintenance is what that interior green space also asks of you. Make sure to treat those indoor pretties to sunshine, water, and the occasional trimming, if required. In addition, before you start laying out that garden, check that your chosen plants’ height are adequate as to not conceal your stairs too much – those plants and flowers need to be a comfy size to really make a nice impact. Know what would look really great? If you plan your plants (and then plant them) in such a way that their heights and sizes increase as your steps ascend, making for a nice visual link between steps and foliage. Our example above succeeded perfectly, opting for a few stones at the front, followed by low-lying plants and shrubs, and then gradually increasing those plants’ lengths as the stairway rises. Adding an abundance of foliage to your staircase means an income of plant treatment too, such as water and pesticide maintenance. This is fine, as long as your staircase doesn’t mind! Wooden steps need special treatment to withstand the extra moisture that go hand-in-hand with freshly watered plants, so ensure that you focus on your staircase just as much as your beloved flora. What will separate your indoor garden from that floor? A border of pebbles? Some uniquely coloured tiles? Whatever option you decide on, make sure it fits in with the overall look of your interiors. Just see the striking contrast (and how well it works) above, with the wooden steps above, and the glass panes underneath that keep the vegetation boxed in. 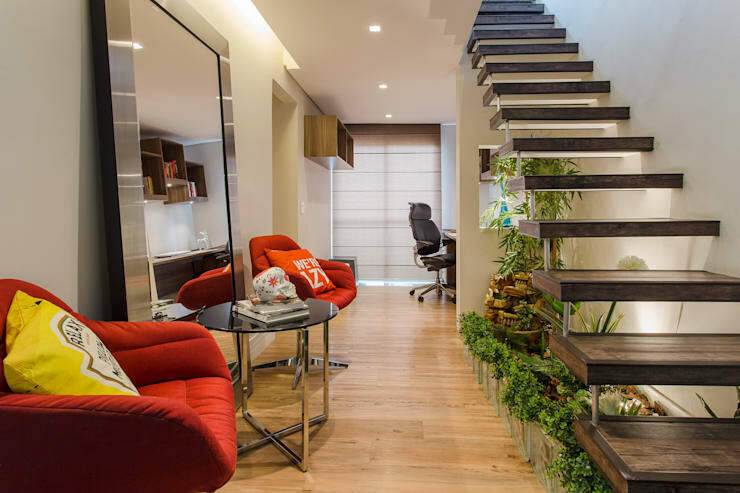 Instead of adding a garden to your staircase, how about doing it the other way around? 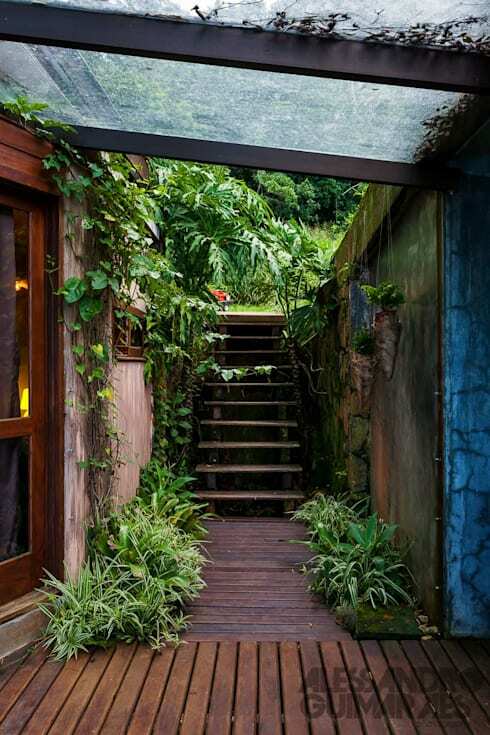 This outdoor space looks expertly maintained and fabulously welcoming with those lush plants and charming greens – and the cheery factor was made all the more striking by adding in some timber steps that not only contrast with the thriving greens, but also fit in with the wooden deck of the two separate floors. 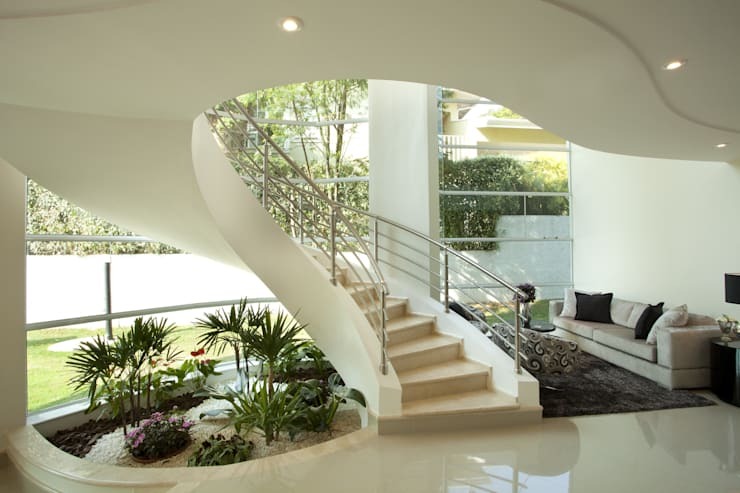 What sort of staircase would you opt for in your garden? 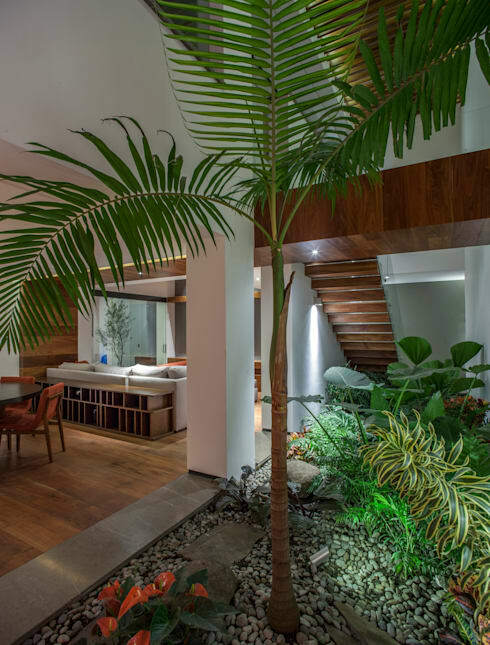 There’s no need to re-create the Amazon jungle inside your house; this example indicates how a small garden space (in this case, a water feature with pebble flooring) can make a big impact if laid out correctly. A linear layout in the same black tone, copying the same width of the staircase – modern design at its best! Not all staircases are linear and straight, you know. In cases such as this example, where that stairway takes a curvy approach to the next floor, your garden needs to follow suit. Therefore, be inspired by that swirly design; let it dictate your garden’s layout so your vegetation space and staircase flow beautifully together. Be sure to see our: Inventive ways to use that wasted space under your stairs. 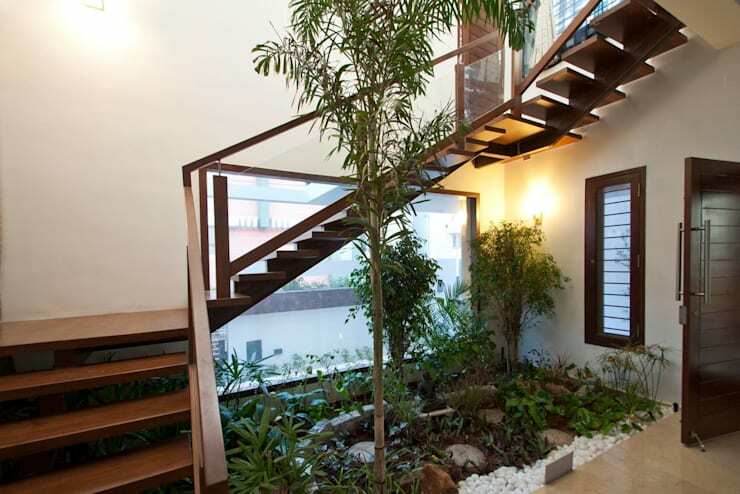 What do you think of adding an indoor garden to a staircase? Share your thoughts in our comments section!